Is there a better alternative to Number String? Is Number String really the best app in Mathematics category? Will Number String work good on macOS 10.13.4? 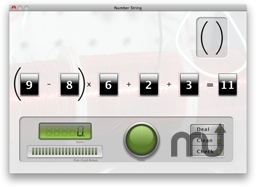 Number String is an application that teaches addition/subtraction and multiplication/division to students. 6 cards are dealt face up. The player tries to combine some or all of the first 5 cards to equal the value of the sixth card. Players may use any combination of addition, subtraction, multiplication and division. Up to 2 pairs of parenthesis may be added if desired. Besides acquiring points, each time an equivalency is completed a "hidden" background picture is displayed. Added a preference for displaying the equal sign on the left. Number String needs a review. Be the first to review this app and get the discussion started! Number String needs a rating. Be the first to rate this app and get the discussion started!